Nothing in the House: 2nd Annual Northeast Pie Contest! 2nd Annual Northeast Pie Contest! If there's one thing I can do well, it's eat pie. I'm excited to put that skill to good use this Sunday, May 6th as a guest judge in the HandsOn Greater DC 2nd Annual Northeast Pie Contest! 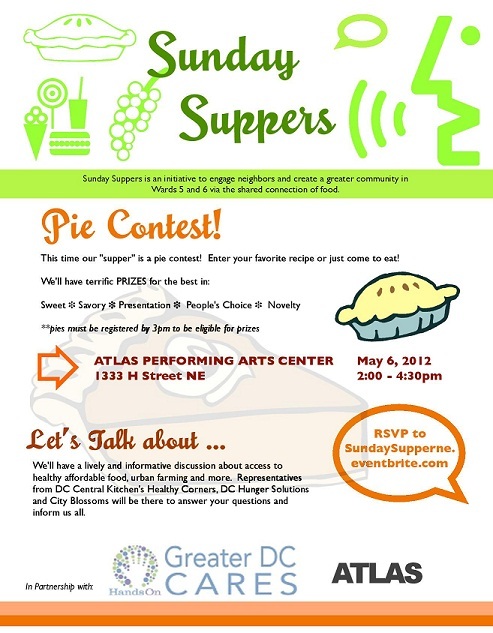 It's happening at Atlas Performing Arts Center 1333 H St. NE from 2:00-4:30pm, and you can RSVP here. The event is free and open to the public--both for pie eaters and pie bakers, and there will be excellent prizes for the winners in five different categories: Sweet, Savory, People's Choice, and Novelty. Despite my love for all things pie, I'm a little nervous about what those novelty pies might contain... 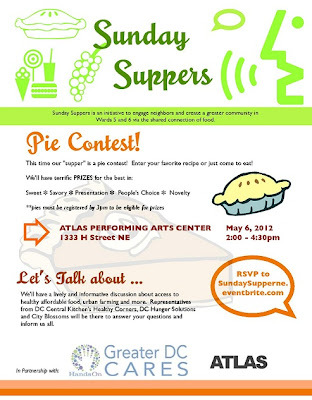 I hope to see all you DC folks there, and for your and my sake both, with delicious pies in hand! Labels: Pie contest, Washington D.C.